Features, Functions and Benefits: Peace of Mind Protects your family and possessions by providing worry-free automatic backup power to your home in the event of a utility power failure. The remote system status indicator also warns you of any troubles with the system from the safety of your home. Convenience: Whether you are home or away, the system automatically supplies power to key circuits during a power outage, eliminating the need for clumsy extension cords required with portable generators. Reliable Performance: The generator provides a reliable, longlasting Briggs & Stratton engine for maximum power, and a built-in weekly exerciser to keep the generator in top operating condition. Continuous Low Cost Fuel Supply: A permanent hook-up to natural gas or liquid propane provides a safe, continuous, environmentally friendly fuel source, eliminating the gasoline storage and refueling required with portable generators. Unobtrusive Design: A sleek housing and small footprint make for subtle yet functional operation. Sound-absorbing panels and a lo-tone muffler also keep sound to neighborfriendly levels. 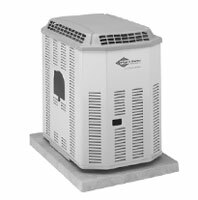 Unparalleled Support: Backed by one of the most established and comprehensive service networks in the industry, every Standby Generator is supported by expert, competitively priced sales and service.